The studio is now a mess of bits and pieces of cardboard, tape, and bubble wrap. I just packed and wrapped artwork for transit. Sanctuary #4 is headed to a collector in New York. And five Bottle Dreams pieces are on their way to the Houston Center for Photography for their upcoming show called Human Nature. Curated by HCP director Madeline Yale, the show “raises questions about the current state of our relationship to the natural environment.” It includes the work of 9 artists and I was delighted to see Paula McCartney’s name on the list, as I really love the cleverness and subtle beauty of her series, Bird Watching. I recently purchased a print of hers on the affordable art site, 20×200. The show at HCP will open with a reception on April 3 and will be up until May 11 with lots of great public programs in between emphasizing environmental concerns like the slow food movement and tree planting. The photo here shows an installation of five Bottle Dreams pieces at the Bolinas Museum in 2007. 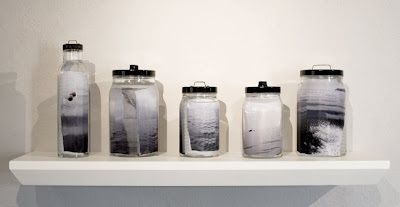 A similar installation will happen at HCP, but the five bottles there will have no trace of mankind – no buoys, no ships, etc – so as to emphasize the tension between pristine nature and man’s desire to control and preserve it. If you are in the Houston area, I hope you will get a chance to see the show.